The migration and refugee flows of recent years have severely strained the stability of the European Union. The wide range of problems and challenges will continue to influence the political events in Europe in the future. 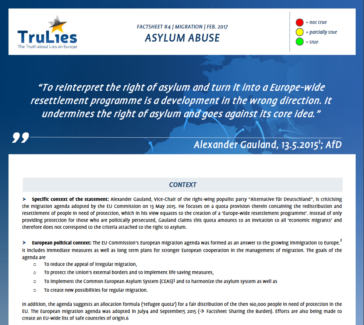 The facts sheets on the topic “Migration and Asylum” are intended to shed more light on different aspects of the European migration crisis. The goal is to understand highly complex issues in an understandable way and to reveal the specific “truths” and “lies” of the arguments. Supportive data, evidence and literature were provided. Exemplarily, an English version of the factsheet on asylum abuse can be found here.